I had a new 2009 Street & now the Speedy R going for it's first service tomorow. Both bikes had coolant leaks because the hose clamps were not tight. It's a quick fix but look for the tell-tale white deposits on the engine casings. Beware, if not cleaned up the casings get marked. Did 2 years of track days on the Street, these bikes don't give problems, I believe the Speed R will be even better because you don't have to rev so high. cheers for the heads up on a few problems! 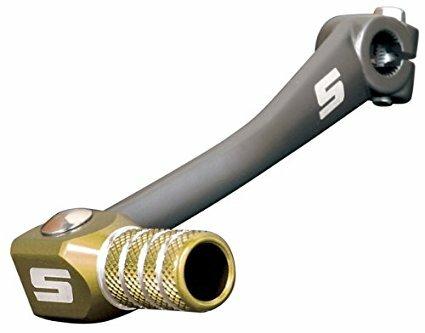 get one of these sunline shifter levers. I've never missed a shift since i put it on. I've been slack these last few years on picking one of these babies up. Manufacturer Part Number 25-01-048 seems to be OOS everywhere I look; would there be an alternative shift lever you guys could recommend? Check 1 off Bucket List...Yeeehaaw! Great tips. Love my new (5k mi.) 2008 S3 more than my woman (that's a lot). Wanted a Trumpet since I was 9 and Dad told me:"Get your helmet and don't tell Mom." before taking me for a 108mph blast on the back of his 1967 T100C Tiger. The thing nearly shook itself to pieces, but planted in me an idea that never died - get a Trumpet. Well, I got a doozy, and am happy to have found this site. My S3 looks like Batman's pit bike.